Here is the next installment of our favorite pattern series. It’s where we ask fans to share a bit about their favorite Oliver + S pattern, telling us why they like it and to show off the multiple times they’ve made it. Today we have Melissa who blogs at Stuff I Make. Here she is. 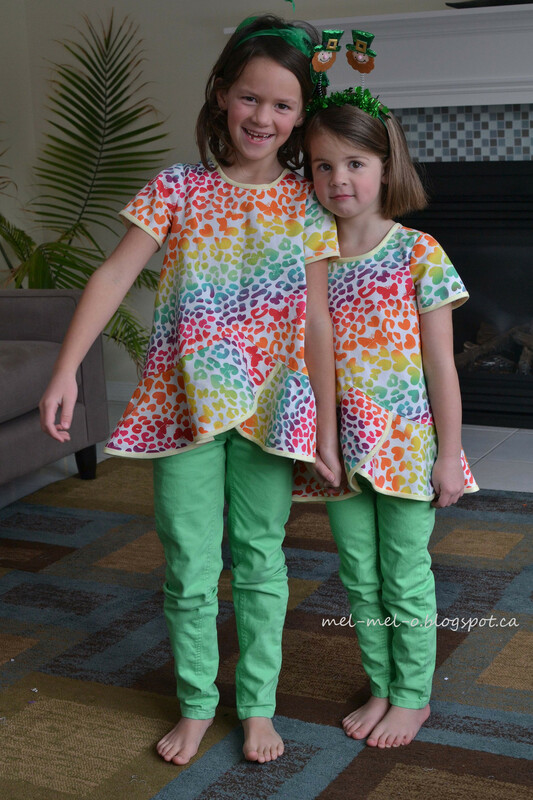 My sewing journey began with some frustrating experiences using patterns with instructions that were difficult to understand and that often resulted in poorly-finished, ill-fitting garments. Then, around 2011, I discovered Oliver + S and was immediately hooked. One of the first patterns I sewed up was the Family Reunion Dress and I couldn’t believe that I produced something so professional looking. The details, the drafting, the finishes but most of all the instructions of the Oliver + S patterns are so fantastic. I know that each time I try a new pattern, I will learn a new skill. At last count, I have sewn up 19 Oliver + S patterns plus tonnes of items using the Little Things to Sew book. Although it’s hard to choose a favourite pattern (and the Family Reunion Dress holds a special place in my heart! 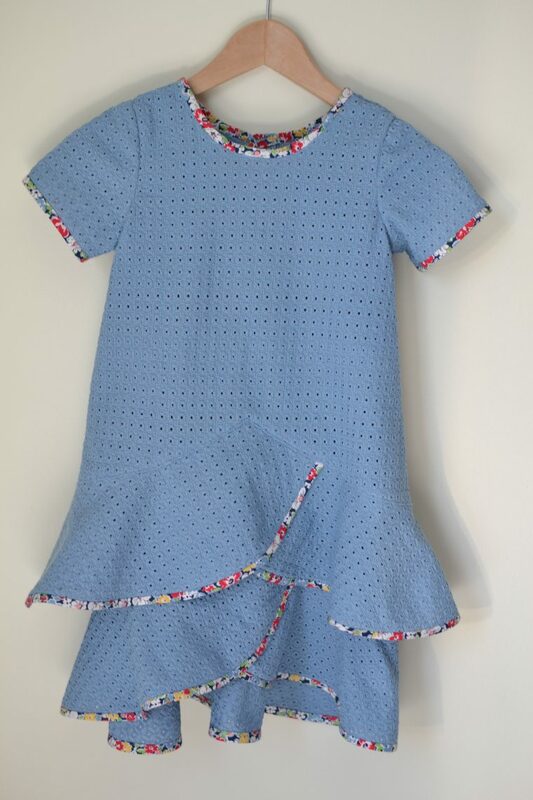 ), I’d have to say that the Pinwheel Dress is one of my favourites and certainly a pattern that I’ve used over and over again. It’s twirly without being fussy, elegant without being too grown up and, by all accounts, comfortable. According to the website, it was released March 5, 2013 and I have pictures of two finished tops that are dated March 16, 2013 so I must have loved this pattern right away! 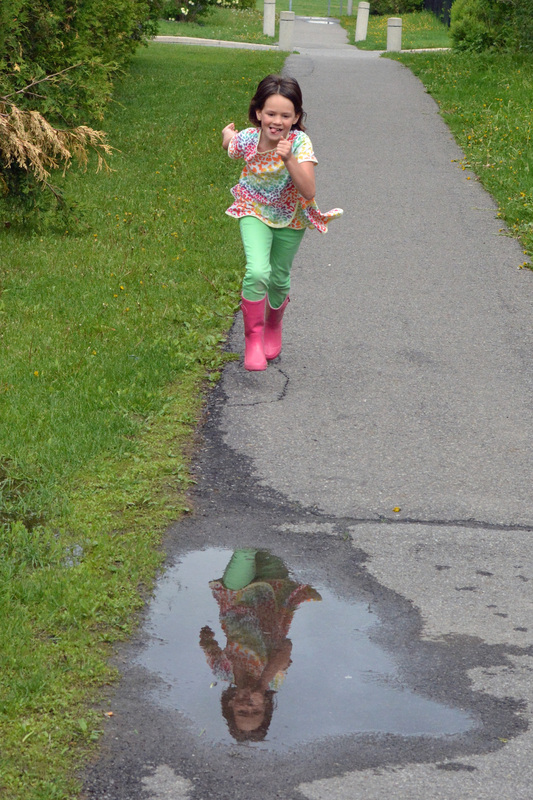 My girls loved having matching outfits to go to a St. Patrick’s Day party. I only made the tunics but they were so cute paired with ready-to-wear skinny jeans and were perfect for playing in after the party. That same year, I had a stack of fabric waiting to be put away, including a remnant of eyelet and a piece of navy linen left over from a top I’d made for myself. They looked so good together that I dropped everything I was doing to make the top and the dress. Both my daughters loved the slip dress of this set and it got lots and lots of wear. The only thing I disliked with the navy linen slip dress was that every time I washed it, I had to iron the facing. I don’t mind ironing when I’m sewing but can rarely summon the motivation to do it after laundry particularly with kids’ clothes. 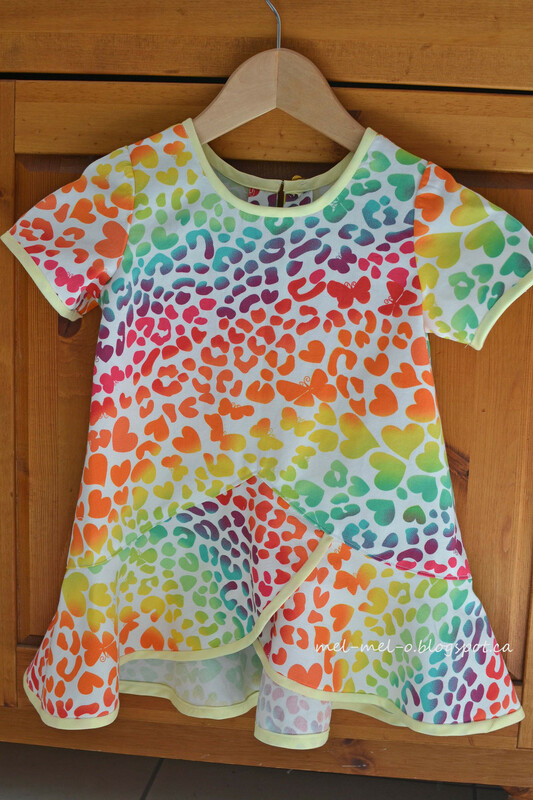 So, the next time I made this pattern, I finished the top and armholes with bias tape. 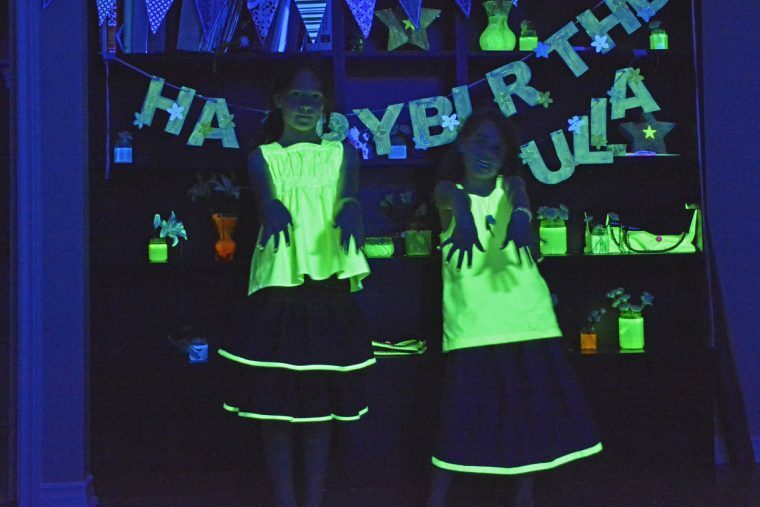 The other change I made was to leave off the “ruffle” at the bottom so that it was just a tank top, which my daughter paired with a denim skirt for her glow in the dark sleepover party. The top in the left is from the Garden Party pattern, another favourite of mine! The last time I made the dress was due to another moment of serendipitous fabric stacking. I bought the chambray for a top for myself and it didn’t read as purple in the store and but when it ended up next to the purple polka dot, it was too great a combination to be ignored. 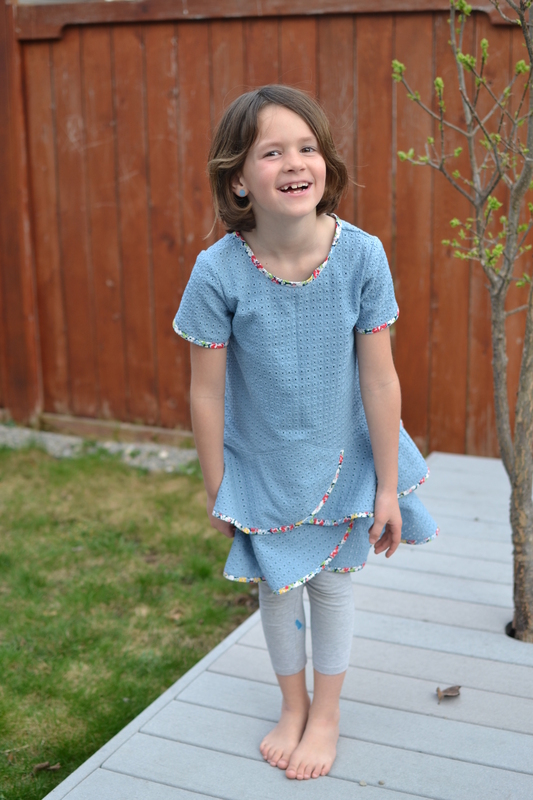 When I presented the idea of a Pinwheel Dress to my daughter, she wasn’t keen but with a few questions I realized it was because she was worried that it wouldn’t meet school dress code as the original straps are too narrow. So I widened the straps and finished the top with matching bias tape. 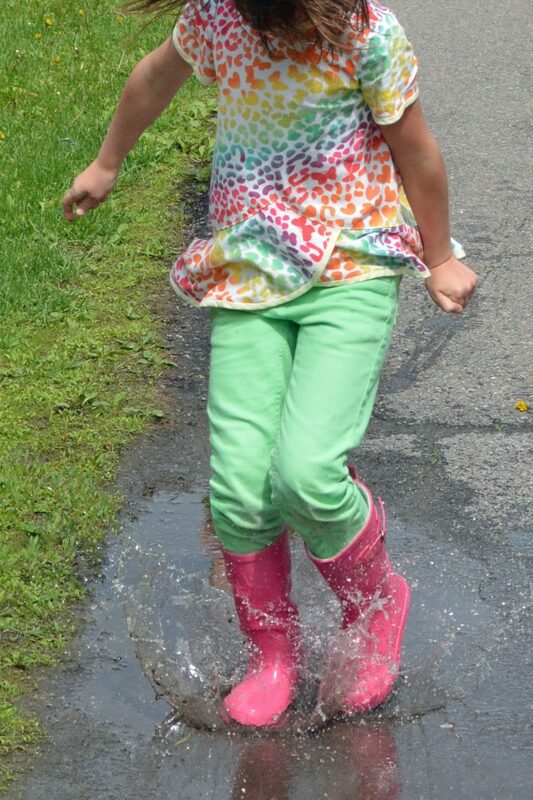 I love, love, love this version and so did she (and there were no issues at school!). But apparently she was in a “posing” phase so these are the best pictures I could find! The last version was another tank top made of super lightweight cotton voile. 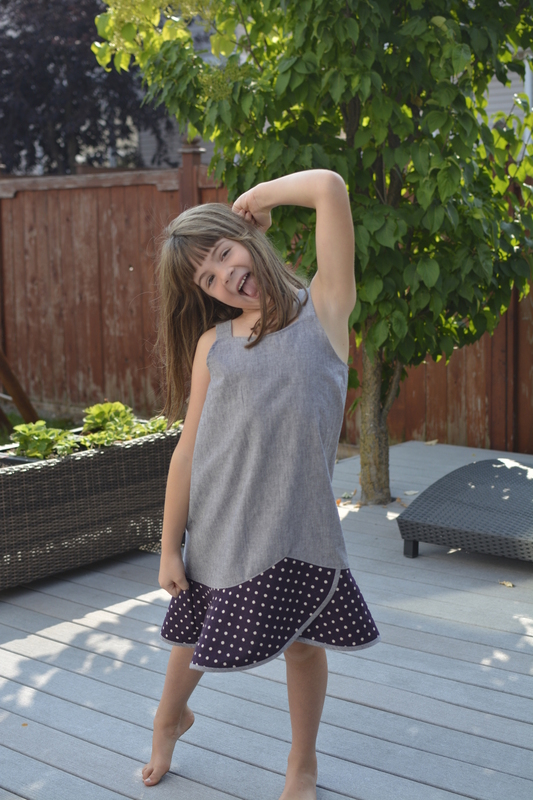 This top is perfect for hot summer days and so cute when paired with the Hopscotch skirt. 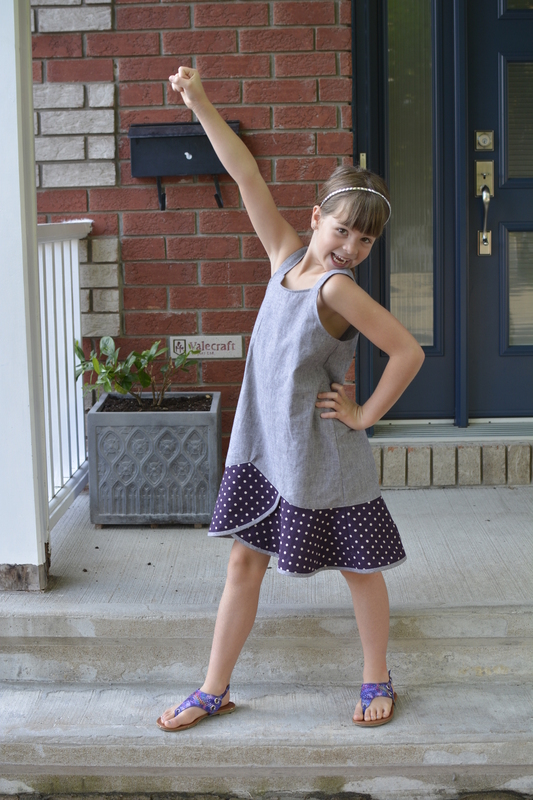 My girls have grown up wearing Oliver + S and I feel like my sewing “grew up” along with them. Sadly they no longer fit into most of the Oliver + S patterns but I will take all of the skills that I’ve learned from Oliver + S to continue sewing for them and for me! And now that my older daughter fits into women’s sizes, a whole new world of patterns (including Liesl + Co. and Lisette!) is open to us! Thanks for accompanying me on my trip down memory lane. Mel you’ve inspired me to dig out my Pinwheel pattern and get sewing! So great to see you again! And yep, I feel a sudden urge to see a pinwheel top now too. What a lovely photo recap of the Pinwheel top & tunic, I had not noticed what a great set of options this pattern can offer for creative sewing. I now have a grand daughter to sew for, and Pinwheel looks like a wonderful starter pattern for her. Thanks for the sewing inspiration. How much fun you and he girls have had with this adorable pattern. I keep intending to use it for my granddaughters but other things get in the way. I am now very inspired. Thank you.